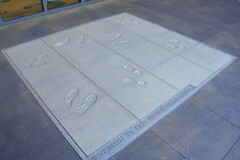 This image, by Corey Seeman on Flickr, is the Monument to your Future Collaborators, on the pavement outside the Knight Management Center in the Graduate School of Business at Stanford University, where Brian Cowen attended the Executive Education Programme last Summer. Cowen probably walked past it, if not over it, several times. But he now says that his attendance at that course was a private matter, and it seems he intends to complain to the Press Council of Ireland and the Office of the Press Ombudsman that newspaper articles about it invaded his privacy. In my earlier post, I know what you did last Summer, Mr Cowen (also here), I was not very sanguine about his chances. However, on his recently-started media law blog, MediaBelf, Jonathan McCully has taken me to task on this. In his post The Prime Minister who went to America to learn how to be a leader (also here) he makes a compelling case the other way. One of his key points is that Cowen is no longer a public figure: “It is difficult to connect information relating to Mr. Cowen’s college activities, such as eating lunch and attending lectures, with the validity of what he had done in public office”. From that, it would follow that he is therefore entitled to a reasonable expectation of privacy as he goes about his life after front-line politics, and that, whilst the public may be interested in Cowen’s college activities, there is little public interest in media coverage of his lunch and lectures. This invites two responses. The narrow one is that Cowen was pursuing a leadership course, which he himself accepted had the potential to lead to his return to the public eye, which would bring the matter squarely within the category of the public interest. The broad response is to object to the premise that Cowen is no longer a public figure. It is true that, at present, he does not hold public office. But the category of public figures is surely broader than that. His legacy casts a large shadow. First as Minister for Finance (2004-2008), and then as Taoiseach (Prime Minister) (2008-2011), he was centrally involved in government policy decisions that continue to have reverberations. Indeed, it is still the case that no conversation about the state of the Irish economy is complete without a disparaging reference to him. He was one of the crucial actors in the most critical decision of the period. The office of Taoiseach, in general, and the decisions Cowen took when he held that office, in particular, are so central to current political discourse that I find it hard to see how he can be other than a public figure. Another of MediaBelf’s key points is that, even if some coverage of Cowen’s course in Stanford is justifiable, the extent of the coverage is not – in particular, he suggests that publication of photographs of Cowen on campus, at lunch, and in class, is unjustifiable. I agree that there will be circumstances in which limited publication is justified but blanket coverage is not, and that there will be circumstances in which discussion is justified by publication of intrusive photographs is not. As MediaBelf argues, referring to von Hannover v Germany (No 1) 59320/00 (2005) 40 EHRR 1,  ECHR 294 (24 June 2004)), this kind of issue requires a nuanced approach. However, I do not agree that this is a case where only restricted coverage, without photographs, is at the limit of what the law allows. Unlike von Hannover, this is not a case of Cowen on family time, shopping and dining with his spouse and children. Unlike, say, Campbell v MGN Ltd  AC 457,  UKHL 22 (6 May 2004), this is not a case of Cowen on intensely private and personal time, seeking private help for very personal demons. As von Hannover v Germany (No 2) 40660/08  ECHR 228 (7 February 2012) demonstrates, the reasonable expectations of privacy of pubic figures are more limited than those of their private counterparts, and these more limited reasonable expectations of privacy allow articles to be written and photographs to be published concerning public figures that would not be publishable if they concerned purely private individuals. The broadcasting of a story involving the health of the Minister for Finance is of public interest and importance. A person’s right to privacy is protected pursuant to Bunreacht na hÉireann 1937 and Article 8 of the European Convention on Human Rights. … The European Courts have been particularly vigilant ensuring that press freedom is not unduly interfered with and the Irish legal system explicitly recognises the importance of the ECHR as can be seen by the enactment of the European Convention on Human Rights Act 2003. There are of course limitations to Freedom of Expression, particularly within the context of the privacy of the individuals. It has been held, however, that in the case of politicians in particular that they can be subject to more scrutiny than other individuals (Lingens v Austria 9815/82 (1986) 8 EHRR 103,  ECHR 7 (8 July 1986)). Further, privacy in the context of public figures must be informed by the degree to which any story makes a contribution to a debate of public interest (von Hannover v Germany (No 1) 59320/00 (2005) 40 EHRR 1,  ECHR 294 (24 June 2004)). TV3 states that it should be noted that in a case surrounding the concealing of President Francois Mitterand’s health, that the Court held that the press’s duty to report “in certain circumstance can even extend to aspects of the private life of public figures, particularly where politicians are concerned”. (Plon (Société) v France 58148/00 (2006) 42 EHRR 36,  ECHR 200 (18 May 2004)). The Committee noted that the role of the Minister for Finance is a pivotal role in Irish Government and given the current economic crisis, the significance of the role is further heightened. Minister Lenihan holds this Office and in this regard, it may arise that issues of his health could be in the public interest. The programme-makers had substantiated that the diagnosis was cancer in this case, which is an illness that could have implications for an individual’s capacity to function effectively at his/her role. In this context coupled with the pivotal role held by Minister Lenihan, the Committee was of the opinion that the news of his health was in the public interest. The Committee also noted that the context of the report was, at all times, the political position of Minister Lenihan. Although this is a decision of the BAI and not of the Press Ombusdman or Press Council, and although this relates to a far more serious invasion of privacy, I think that it states the approach which is likely to be taken on Cowen’s complaint. And, on that approach, I think that the public interest will trump Cowen’s right to privacy. Having thought about the issue a little more, I think that there is more to be said in favour of Cowen’s invasion of privacy argument that I had initially given it credit for, and I am grateful to MediaBelf for putting the other side of the argument. I am still not persuaded of the merits of Cowen’s case, but I do now accept that it is stronger than I had initially thought it was. At the end of the day, as politicians are wont to say, I can still know what you did last Summer, Mr Cowen, and in fact we can all still know what you did last Summer, Mr Cowen, because you are a public figure, and it is in the public interest for us know when you are pursuing courses in preparation for to a possible return to public life. Meanwhile, welcome to the Blawg O’Sphere, MediaBelf. I look forward to more high quality posts. I’ve already subscribed to the blog’s RSS feed (see my ‘Media-Speech blogs’ bundle, in the blogroll on the right), and I urge readers to do so. Handing over customer records as protected speech?